Congratulations to Australian, Geoff Ogilvy, for beating Paul Casey in the final of the Accenture Match Play Championship in Arizona, having already beaten the person (Rory McIlroy), who beat the person (Tim Clark), who beat Tiger Woods on his long-awaited return to competitive golf. During the final there was an interesting Rules situation on the par-5 11th hole when Geoff’s ball bounced into the desert and came to rest in a jumping cholla. This strange cactus gets its name due to the ease with which the stems detach when brushed, giving the impression that the stem jumped onto you. Often the merest touch will leave a person with bits of cactus hanging on their clothes to be discovered later, when either sitting or leaning on them. Geoff soon realised that he would not be able to take a swing at his ball in the cactus and later confirmed that he did not want to put his hand anywhere near it. 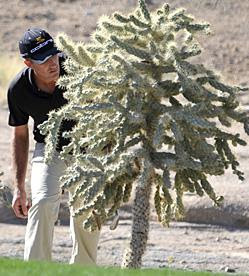 After a brief conversation with the PGA Tour Rules Official, Geoff opted to deem his original ball unplayable, leaving it in the middle of the cactus. He was permitted to do this as all three options for relief under Rule 28, Ball Unplayable, allow the player to substitute a different ball, under penalty of one stroke. The wording of the options use the term ‘a ball’, which means any ball, rather than ‘the ball’, which means that the original ball has to be played. Watch out for this subtle difference as you follow the Rules. As can so often happen in golf, this story has a happy ending for Geoff Ogilvy. He took his ball unplayable penalty, dropped a new ball 40 yards back along the line from the flagstick through where his ball was at rest in the cactus, and played up short of the green. He then chipped into the hole for a par, winning the hole from Paul Casey who missed his putt for the half.